Born in Ceylon (now Sri Lanka) in 1950, Cresside Collette migrated to Australia in 1962. Originally trained as a Graphic Artist at the Royal Melbourne Institute of Technology (RMIT), she worked as a book illustrator and advertising artist whilst developing large embroideries and exploring the textile arts. She was employed as a foundation weaver of The Victorian Tapestry Workshop (now the Australian Tapestry Workshop) in 1976, where she worked as a production weaver for fifteen years. In 1980 she undertook post - graduate studies in the Tapestry Department of the Edinburgh College of Art, Scotland, and subsequently completed a Master of Fine Art (by Research) at Monash University in Melbourne in 2003. Exhibited in both individual and group shows consistently since 1971, her work is represented in both public and private collections. She tutored in drawing and tapestry weaving in the Studio Textiles and Design Course at RMIT University for eleven years. A tapestry weaver for whom drawing has always been an integral part of her fine art practice, her paper, "In translation - drawing as the foundation for and manifestation of tapestry", was delivered and published as part of the "DrawingOut" conference at RMIT in Melbourne in 2010. In 2003 and 2004 she was awarded residencies at Bundanon (the estate left to the nation by renowned Australian artist Arthur Boyd) where she pioneered working "en plein air" in the medium of tapestry. The resulting exhibition of tapestries and drawings, A Month at Bundanon was shown at the Box Hill Art Space in Melbourne and the Drill Hall Gallery in Canberra. 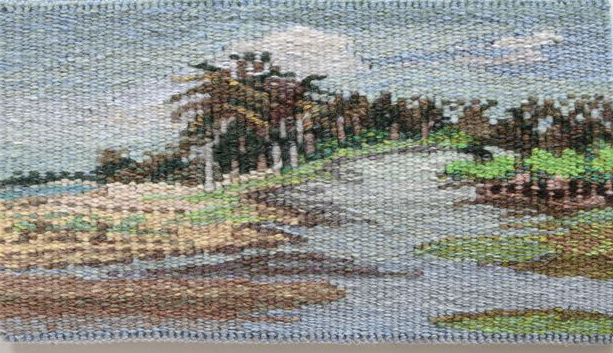 Her exhibition, Woven Worlds; ten years of 'en plein air' tapestries, is touring nationally between 2014 - 2016. Over the last 25 years she has combined her own exhibition practice with designing and producing community tapestries for schools, city councils and universities. Her current art practice examines the dichotomy of belonging to two lands, inspired by her return to Sri Lanka in 2009 to attend the Lanka Decorative Arts Workshop and subsequent visits over the past few years. Click in the images below to see more. 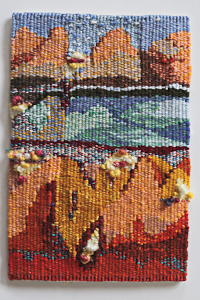 This is a series of drawings and textile pieces encompassing woven tapestry, embroidery and soft sculpture made in 1998. Inspired by Classical Greek sculpture, it is an exploration and commentary on its survival in the face of the ravages of time. This body of work comprises my 2004 Master of Arts exhibition "Material Bodies". It is a collection of drawings and tapestries that reconstruct "moments" from Classical sculpture and Renaissance and Baroque painting that refer to textile. The work explores fabric's ability to simultaneously mask and reveal the human form. Bundanon is an artists' retreat in NSW established by the Australian artist Arthur Boyd. As Artist in Residence in both 2003 and 2004 I produced a series of miniature "en plein air" woven tapestries and pastel/charcoal drawings. This work is an evocation of the landscapes of Sri Lanka and Australia, combined in unlikely but comprehensible form. Drawn from monotypes and collages, it reflects a childhood spent on a lush tropical island and subsequent migration to this more unforgiving environment. A Manningham Art Gallery touring exhibition of small tapestries woven 'en plein air' at Bundanon and other locations within Australia as well as in Sri Lanka and France. The exhibition is touring nationally between 2014 - 2016.